Dimensions 0.25 by 3 by 4.50 in. Amazon.com description: Product Description: Compiled more than two thousand years ago by a mysterious warrior-philosopher, The Art of War is still perhaps the most prestigious and influential book of strategy in the world today, as eagerly studied in Asia by modern politicians and executives as it as been by military leaders since ancient times. As a study of the anatomy of organizations in conflict, The Art of War applies to competition and conflict in general, on every level from the interpersonal to the international. Its aim is invincibility, victory without battle, and unassailable strength through understanding of the physics, politics, and psychology of conflict. Translated from a standard collection of commentaries on Sun Tzu's text by eleven interpreters, this pocket classic has been edited by Thomas Cleary to bring out the meaning of the principles of strategy. 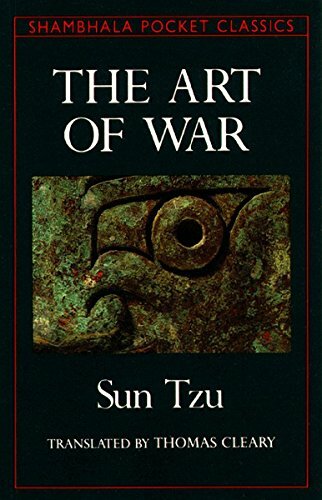 About: The world’s most famous military treatise, in an acclaimed translation by the award-winning translator of the Tao Te Ching and the I Ching For more than two thousand years, Sun-tzu's The Art of War has provided leaders with essential advice on battlefield tactics and management strategies. About: Antoine-Henri Jomini was the most celebrated writer on the Napoleonic art of war. About: Compiled more than two thousand years ago by a mysterious warrior-philosopher, The Art of War is still perhaps the most prestigious and influential book of strategy in the world today, as eagerly studied by modern politicians and executives as it has been by military leaders since ancient times.